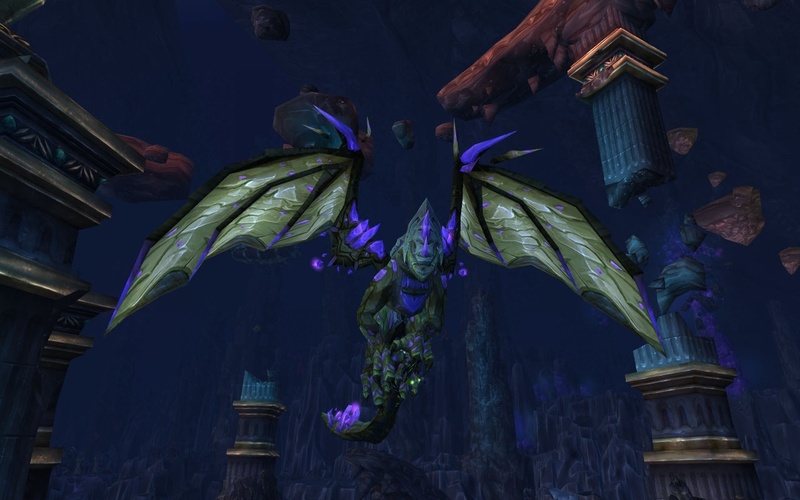 This is a guide to explain the new mount's within the Cataclysm Expansion. 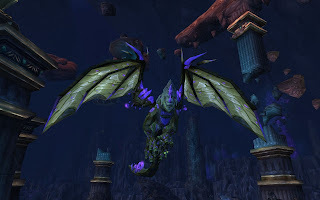 Over 20 mounts have been added, below I will explain how to find, earn or otherwise acquire all of the new Cataclysm mounts!. Ground Mount. These mounts can be purchased for 1,200 Gold upon your Guild reaching Level 25. These mounts are in my opinion the coolest in the expansion as they just look fantastic. Not easily obtainable as for your guild to reach level 25 it will take some time and alot of team work. Also you must be exalted with your guild to be able to purchase the mount. The math suggests that it will take 137 days (or 4.5 months) of hitting your guild's daily experience cap in order to reach guild level 25. Flying mount. Awarded by completion of the achievement Glory of the Cataclysm Hero which requires you to complete every Heroic dungeon at least once (for Cataclysm Dungeon Hero) but to complete a number of challenging achievements in those Heroics. Flying mount. Awarded by completion of the achievement Glory of the Cataclysm Raider which requires you to clear all of Blackwing Descent, Throne of the Four Winds and The Bastion of Twilight, completing various achievements along the way and also requires a defeat of each boss on its Heroic difficulty mode as-well. Flying mount. Available to be purchased for 3000g after completion of the guild achievement Guild Glory of the Cataclysm Raider which requires you to clear Blackwing Descent, Throne of the Four Winds and The Bastion of Twilight while in a guild group. In order to qualify and receive credit for these objectives, your raid must be comprised of at least 8/10 or 20/25 guild members. You can tell that you are in a group that qualifies for guild achievements by checking for your Guild Tabard up near your minimap. Upon completion the achievement, you will be able to purchase this mount from your faction's guild vendor. Flying mount. This is a Rare drop from Al'Akir in Throne of The Four Winds, has a low 1-2% drop rate. Flying mount. Rare drop from Altairus in The Vortex Pinnacle in both Normal and Heroic difficulty modes also has a 1-2% drop rate. Flying mount. Guaranteed drop from Aeonaxx in Deepholm. Aeonaxx spawns near the Quartzite Basin and will fly to and around the Temple of Earth. If you find him, you must mount him and kill him before getting overwhelmed by his whelp adds! If you are successful, the mount will be yours. Ground Mount. Drops from Dormus the Camel-Hoarder in The Steam Pools. By seeking out Mysterious Camel Figurine, small statues found hidden in the sands of Uldum. Some of these statues are too damaged and will crumble into dust, but if you find the right one, prepare to get whisked away to The Steam Pools above Feralas, where you must defeat Dormus the Camel-Hoarder. Ground Mount. Purchasable for 165 Tol Barad Commendation upon reaching Exalted with Hellscream's Reach (Horde) or Baradin's Wardens (Alliance). Once you have reached Exalted, you can purchase one of these mounts from your faction's quartermaster, Pogg for Horde, Quartermaster Brazie for Alliance. For 165 Told Barad Commendation a new battleground currency awarded by completing objectives / winning in Tol Barad. Flying mount. Purchasable for 200 Tol Barad Commendations upon reaching Exalted with Hellscream's Reach or Baradin's Wardens. Ground Mount. Purchasable for 80s or 8g upon reaching Exalted with Bilgewater Cartel. The new Bilgewater Cartel faction mount is available to goblins by default and every other Horde race upon reaching Exalted with the Cartel. Horde players can use the Bilgewater Cartel Tabard to earn reputation. Ground Mount. Must randomly discover and complete the Fossilized Raptor rare Fossil archaeology project. Upon surveying at a fossil dig site, you have a chance to randomly discover this rare artifact and must collect enough Fossil Archaeology Fragment (100) to complete the project. Upon assembling the project you will create a Fossilized Raptor! Ground Mount. Must randomly discover and complete the Scepter of Azj'Aqir rare Tol'vir archaeology project. Upon surveying at a Tol'vir digsite, you have a chance to randomly discover this rare artifact and must collect enough Tol'vir Archaeology Fragment (150) to complete the project. Thankfully, this artifact has three keystone slots which means you can use 3 Tol'vir Hieroglyphic towards completion of the artifact, which counts as a whopping 36 Tol'vir Archaeology Fragment! Upon assembling the project you will create a Scepter of Azj'Aqir! Flying Passenger Shapeshift. This BOE mount can only be crafted by a skilled Alchemist upon learning the Pattern, which can be found inside a Canopic Jar. First, you have to be an archaeologist and you have to get lucky and find fragments of a Canopic Jar. Upon collecting the appropriate amount of Tol'vir Archaeology Fragment you will be able to complete the jar, and then open it. If you're lucky (again) it will contain a Recipe: Vial of the Sands, which can be learned with 525 Alchemy skill. Once you've learned to craft it, you then need to acquire the (costly) reagents. This is one of the most expensive items to craft, requiring vendor items totaling 29,000g and a number of flasks and other alchemy created materials. Aquatic mount. Rewarded upon completion of The Abyssal Ride in Kelp'thar Forest. A necessity for questing, gathering or otherwise doing anything underwater in Vashj'ir, and as such is easily obtained as a quest reward after completing a chain of introductory quests upon arriving at Kelp'thar Forest. Unfortunately, this mount can only be used in Vashj'ir. Flying mount. Obtained via redeeming loot card code from WoW Trading Card Game's Worldbreaker Expansion. Same model as other drakes with just a new coat, look's ok. Not amazing. Though it'll no doubt be substantially rare. I hope this helped to clear things up with how the new mounts are obtained and where they come from.